Facebook is an ideal social network for tour operators and activity providers because it’s where your customers are. Here’s how to use Facebook for tour operators. As the largest social network, it would make sense for you to have a Business Page set up where people can easily find you and engage with you. What is the point of creating a Facebook Business Page? While it will probably take a while to accumulate a following, having past customers show that they “like” your page will count as word of mouth recommendation to their friends – which is something you want. You should also install the Recommendations bar so that former customers can leave great reviews of your tour or activity. Facebook’s best feature for businesses is its app integration. 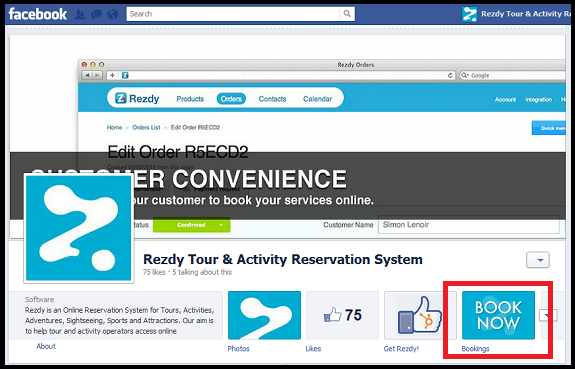 Click here for instructions on how to integrate Rezdy with your Facebook Business Page. If people find you through Facebook you want to make sure that the path to booking is as easy as possible. Why make them go to your website when they can book directly on while they’re logged into their Facebook profile? Now that you’re all set up, all that’s left to do is work on making it an active online community. One way to do this is through Facebook contests. Because Facebook is social by nature, it would also be a good idea to let your audience know about gift vouchers that you have running. Click here for instructions on how to create a voucher through Rezdy. Of course, you can’t just promote yourself the whole time, so make sure that you share interesting industry news as well. The aim is to get people to Like and Comment on your posts so that you can talk back. Which brings us to our next point. You don’t want your Facebook Company Page to be devoid of any interaction. People should see that your business is run by humans and be more likely to book with you. In fact, you want it to be chalk-full of reviews from happy customers. For tips on how to get more Facebook testimonials, click here. If you’re stuck for ideas, check out how a couple of our customers – Salt Air NZ and Sydney Coast Walks – manage their Facebook page.